Blurb: Reading about danger never prepared Samantha Prince for the desperate phone call from her brother in Brazil that sent her from the safety of her New Orleans bookstore into the rugged, inhospitable Amazon in search of him and a hidden treasure. And reading about romance never prepared Samantha to resist the mysterious appeal of Brock Slader, a guide she hired to help her in her quest. She waved her hand to show just how hot the book was. While Mrs. Carson examined both books again, Samantha glanced around at the rows of bookshelves. After three years her business was doing very well—at least well enough for her to afford a vacation. Maybe she’d go to some exotic place, she thought as Mrs. Carson decided to buy both the romance and the mystery. When Mrs. Carson left the Purple Ink, the noise of New Orleans traffic and a blast of cold air rushed into the shop. Samantha shivered and pulled the front of her brown sweater more securely across her chest. Somewhere exotic and warm, she amended. In her mind the only good thing to come from cold weather was curling up in bed under layers of wool blankets with a great book to read while sipping a steaming cup of hot chocolate with lots of marshmallows in it. Tonight, she vowed as she began to finish restocking the shelves of the adventure section. Pausing to examine a cover on one book, she was instantly reminded of her younger brother, Mark, who traveled the world, going from one adventure to the next while she remained in New Orleans, working day after day to make Purple Ink a success. The biggest adventure Samantha ever encountered was the rush hour traffic on Interstate 10. Sighing heavily, she completed her task and noted it was time to close up for the day. Standing, she stretched to ease the ache in her lower back. It was time to start exercising again. The holiday season had been busy, and she got out of the routine once Thanksgiving had passed. Now it was the first of February, and she had ignored her better sense and found excuse after excuse not to get back to it. Though exercising would never head her list of favorite things to do, she promised herself to sign up for a new aerobics class. Soon. Maybe in a month or so. Nell was always teasing Samantha about how neat and orderly she was. But she had practically raised her younger brother while her mother had worked to support them. As a teenager she had juggled school, part-time work, and housework. It hadn’t been easy, but her mother and younger brother had depended on her, so she had learned to be organized the hard way. Samantha went through the same routine to close her shop as she had done ever since she had bought it. After one final survey of her store, she went out the back door to her car. Mark always laughed about her and her routines, but they gave her a sense of security and stability that was important to her. Neither she nor Mark, as children, nor their mother, had had much of either. It didn’t seem to bother her brother, but it did bother her. The tone of her brother’s voice, laced with impatience, alarmed Samantha. Tiny prickles of fear rose on the nape of her neck. “Why did you call?” She forced her voice to remain calm while her grip tightened on the receiver. He was her only close relative, their mother having died four years before. Though they didn’t see each other a lot, she loved him very much and their relationship was a good one. There was no mistaking the desperation in his answer. The tingles of fear quickly spread down her body. “Are you in some kind of trouble?” As a child she had rescued her brother from a few situations. He had always been daring; there was a bold recklessness about him that was very appealing, yet dangerous too. They were like night and day. Static crackled over the line, and Samantha placed her hand over her other ear as if that would help her hear him better. Samantha collapsed into a chair, her whole body trembling. She thought about pinching herself; surely she had dreamed the telephone conversation. But the fear and sense of urgency reminded her of the reality of the phone call, and she was chilled with dread. Something of great value under the altar of the Para Mission church? What? How was Mark involved? Was it something illegal? Why was he running scared? And from whom? Her mind felt as if it would explode from all the unanswered questions bombarding her. A thousand dollars! That would wipe out most of her savings for her vacation, but if Mark was in trouble, Samantha would sell her house and her bookstore if she had to. If Mark was in trouble. From the sound of his voice he was in trouble. She knew she would be at the bank first thing in the morning. Samantha stood frozen, holding her check for one thousand dollars in both hands. Mark hadn’t picked it up. It was hard for her to believe that her money had been returned that morning. But if he was going to pick it up, Mark would have in a week’s time. Her hands began to shake, and she almost dropped the check. What or who had prevented her brother from getting the money? The questions she had been avoiding all morning invaded her thoughts, and she sank into her desk chair in the back of her bookstore. Call! She’d call him at the Grand Hotel in Manaus. Maybe he was still there and didn’t need the money anymore and that was why he hadn’t picked it up. Maybe everything was fine now. Maybe the moon really was made of cheese. Apprehensive about what she would find out, Samantha placed an international call to Brazil. When the man who answered at the hotel couldn’t speak English, she was at a loss. “May I speak with Senor Prince?” Samantha spoke very slowly and in a loud voice, as if that would make things clear. She had never been good at learning foreign languages and envied her brother, who knew five fluently. The stream of words that followed was unintelligible. Frustrated, Samantha finally hung up, concluding there was no Senor Prince at the Grand Hotel. Next she put a call through to Mark’s apartment in Rio and prayed that her brother would answer. On the twentieth ring she gave up and slammed the phone down, even more frustrated than before. Her fear returned in full force. For five minutes she stared at the check, her mind churning with possible courses of action. Suddenly she turned to her laptop and punched in an address. Five minutes later she’d booked a flight to Rio. She would go to Mark’s place in Rio and find out what she could about his whereabouts. Since he was no longer at the hotel in Manaus, maybe he had returned to Rio and wasn’t in his apartment at the moment. She would keep calling until she had to leave the next morning. She prayed she was panicking for no reason. “I can’t believe you’re dropping everything to go to Brazil to look for your brother! This isn’t you. You don’t do things like this,” Nell had said. “Find out where he is and tell him to stay put. I’ll check in with you every few days.” Horns blared behind Samantha, and she realized she was sitting at a green light with angry motorists waiting on her. Embarrassed, she gunned her engine and sped forward. She welcomed the familiarity of her small house, and before attempting to pack, she fixed herself a cup of hot tea and sat down at the kitchen table to organize what she had to do in the next twelve hours before she left for Rio. Passport. Thank goodness she had one from that aborted trip to Europe. Clothes? What kind of clothes should she take to Rio? Wasn’t it summer there? Clothing for a hot, humid environment. A couple of sundresses. Maybe a pair or two of shorts. A bathing suit. Sandals. Samantha was immediately whisked into another world and didn’t put the novel down until she couldn’t keep her eyelids open another minute. She glanced at her bedside clock and gasped. It was three in the morning. She had to leave at seven! Sleep finally descended, but it was a restless sleep, saturated with pictures of painted Indians with lip discs and spears tipped in poison. Samantha tossed and turned, visualizing herself as Diana as she last read about her: standing at the top of a waterfall with a rushing river in front of her and the headhunters in back. Either way Diana went appeared to be instant death. Cold reality returned the next morning as Samantha hurried to make her flight to Rio via Miami. She wasn’t able to catch her breath until the plane was in the air and the meal was being served. Then the idea of what she was doing struck her with a powerful impact. She was flying down to Rio with one day’s notice, trying to locate her brother in one of the largest countries in the world. She wasn’t a detective and really knew nothing, other than what she had read, about what a detective did to find a missing person. What was happening to the sensible, logical woman she was? That question returned to plague her in Rio as she waited while her brother’s neighbor, whom Mark had said always had his spare key, let her into Mark’s place. Before her lay the wreckage of a once presentable bachelor’s apartment. Everything was torn or shattered, nothing left untouched. Someone had searched this place very thoroughly, and she knew it was connected with Mark’s mysterious phone call the week before. Samantha moved slowly into her brother’s apartment. Suddenly she knew the fear Diana felt looking down at the rushing river. And Samantha knew what she had to do next: go to the Amazon to Manaus. 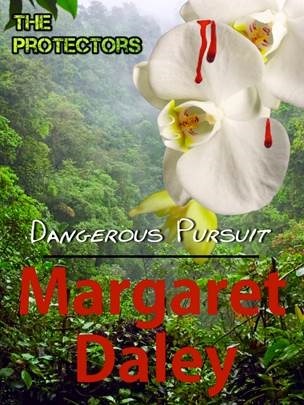 Margaret Daley, an award-winning author of eighty-five books, has been married for over forty years and is a firm believer in romance and love. When she isn’t traveling, she’s writing love stories, often with a suspense thread and corralling her three cats that think they rule her household. 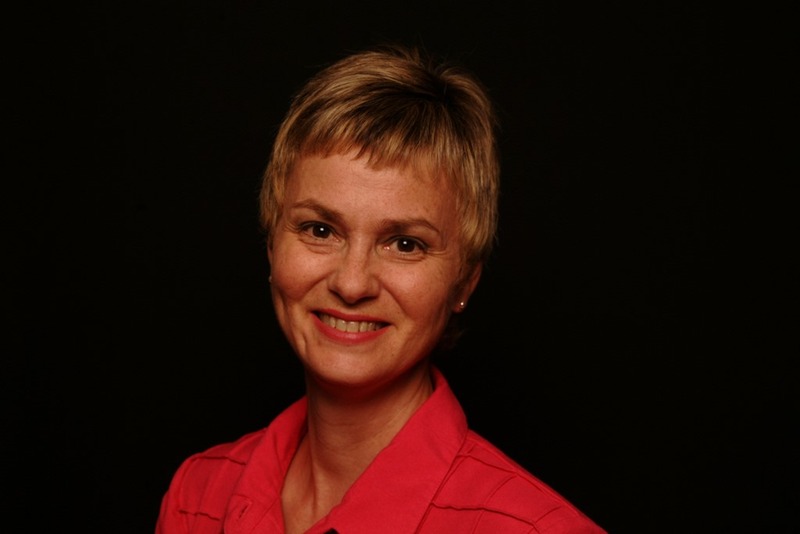 To find out more about Margaret visit her website, Twitter at and Facebook. 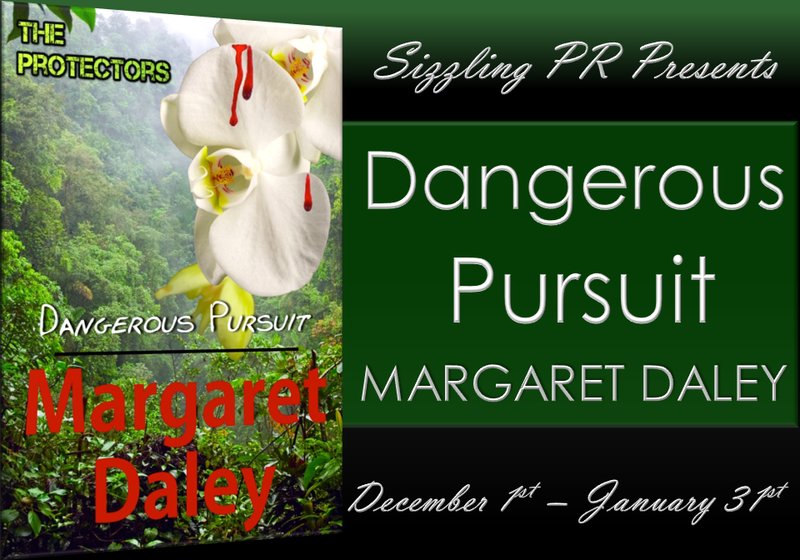 Win one of five copies of Dangerous Pursuit.